That massive, tall, towering giraffe is … so huge…. and its head is coming down to my son’s side. That purple tongue is rolling around the carrot in his hand. Look, you just cannot beat being close to animals, it’s so good for us. From sparrows to kookaburras and on to the most massive animals on the planet; we humans are supposed to live close to animals. African animals are the top of the pile, the sultans of the savannah and the mind boggling biggest of the bunch. It is quite remarkable to spend time in their company, especially in their close company… but hard to do outside Africa. 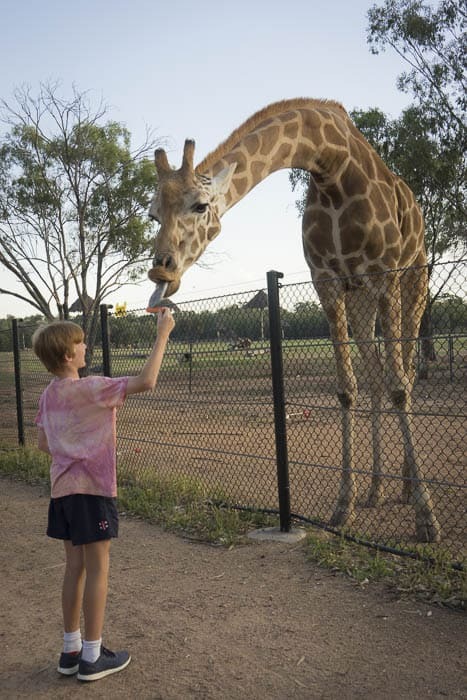 Taronga Western Plains Zoo at Dubbo offers this unique experience and the best way to get close to the African animals there is to stay at Zoofari Lodge. But it is special and it is unique. 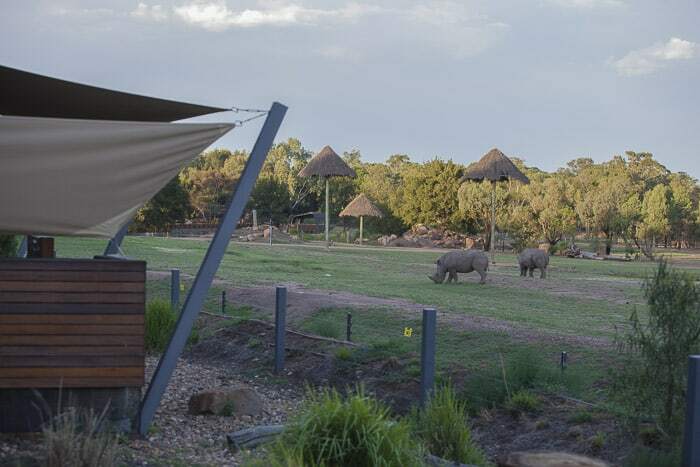 A stay at Zoofari Lodge is a really wonderful way to celebrate a birthday, anniversary or special occasion. Here’s why. 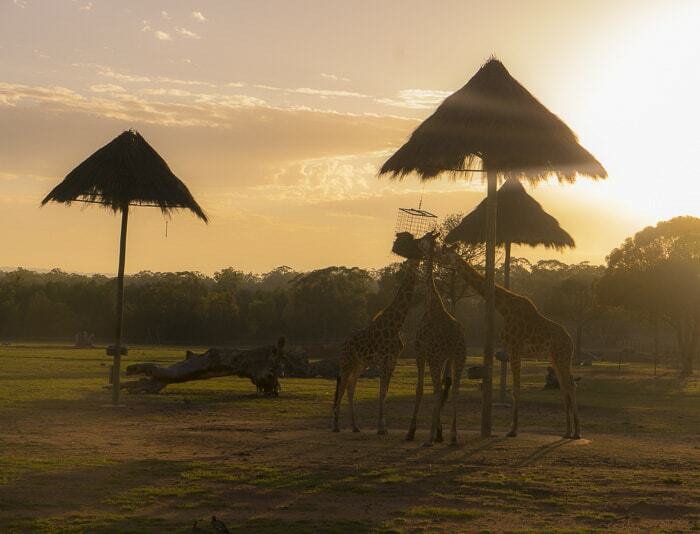 Western Plains Zoo Dubbo is enormous, with over 4000 animals from 350 species living in its 300 acres. 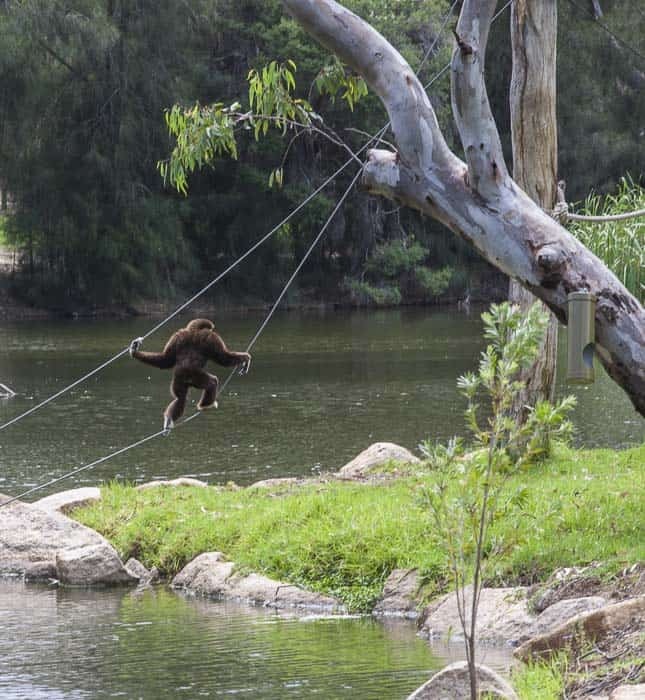 This is the only zoo in New South Wales which has animals ranging over such wide open spaces. It’s a joy and it’s exciting to see animals in a much more natural setting than most zoos can offer. 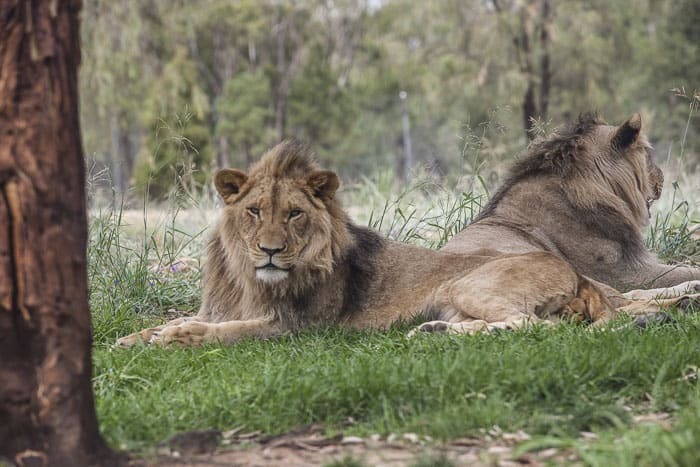 The new Lion Pride Lands allow you to get pretty close to the many lions who live at Western Plains Zoo. 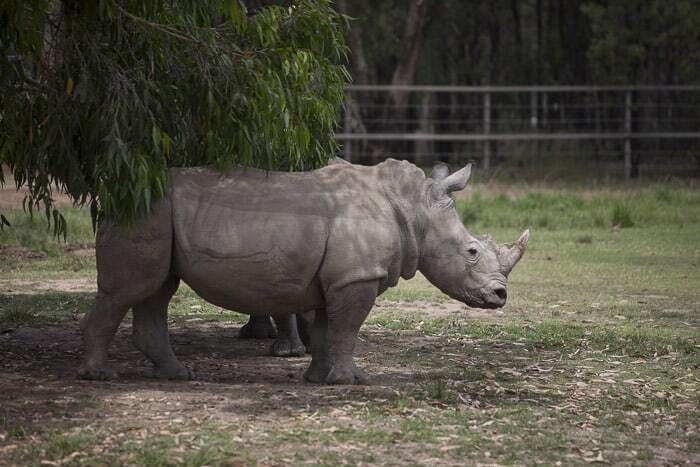 The rhinos are one of the most endangered of all species found at Western Plains Zoo. One of our highlights was listening to our specialist guide explain in detail the worldwide conservation efforts going on to preserve these massive herbivores. You have entrance to the zoo for two days and it’s great to make the most of that by travelling around it on both days. You can cycle around (free with a Zoofari Lodge stay) or drive, walk or rent a golf cart. 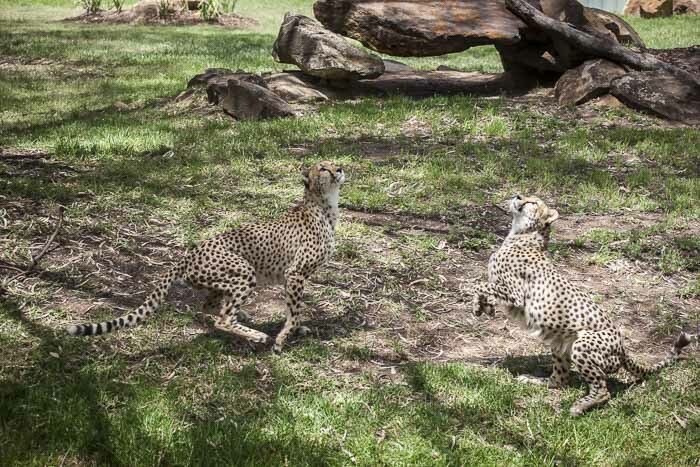 Timing your Zoo circuit to coincide with some of the keeper talks and feeding times is an excellent idea. These captivate my kids a great deal more than just reading the information boards. There are all sorts of bits of information to be learned, and the obvious passion of the animals keepers is very inspiring too. I think that these tours were the best thing about our stay at Zoofari Lodge, they were a real treat. There is always one tour after dinner, plus another very early in the morning. Since many animals are most active at dawn and dusk these are excellent times to get out and about with an expert guide. The bus goes along routes only used by zoo staff, this is a real behind the scenes tour. On the night tour we loved seeing the elephants and rhinos up close. Being able to ask questions of the guide is a real treat too, we learned so much more than expected, especially about how giraffes sleep and the daily lives of the elephants and rhinos. We had not realised just how much breeding happens at the Zoo and also how many animals are moved from one zoo to another, to breed effectively and safely. The best bit about the morning tour was meeting a baby rhino and his keeper. 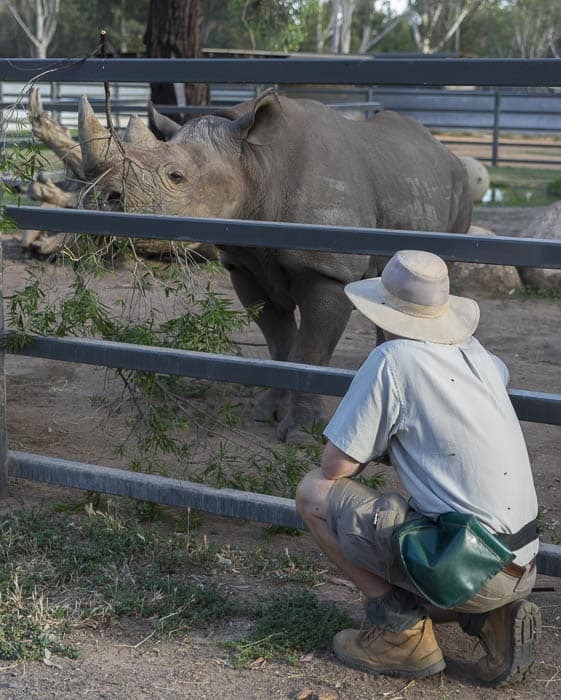 This rhino was being fed and is getting used to having visitors around him. We loved seeing the old lady Indian elephant being hosed by her keepers too, and hearing about all the elephants in Australian Zoos. Did you know there are no African elephants in Australia at all? 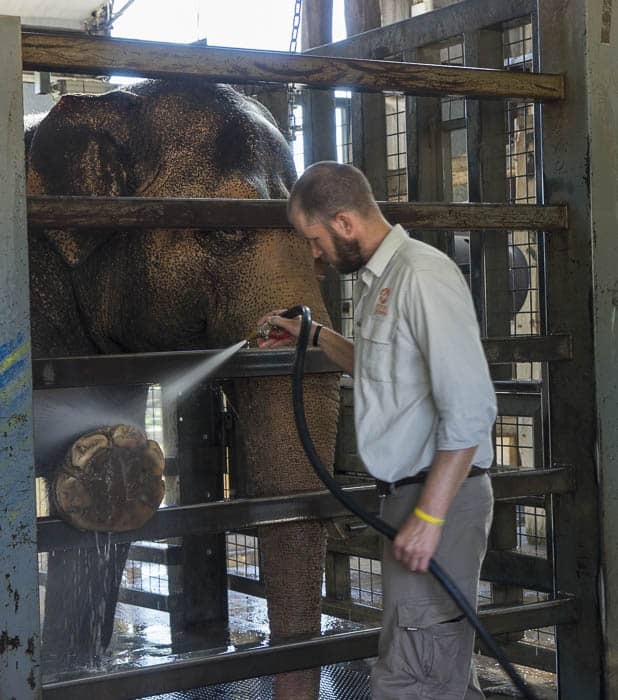 Foot washing is all part of the daily routine for elephants and their keepers. The lodges at Zoofari come straight out of Africa, as does the setting. 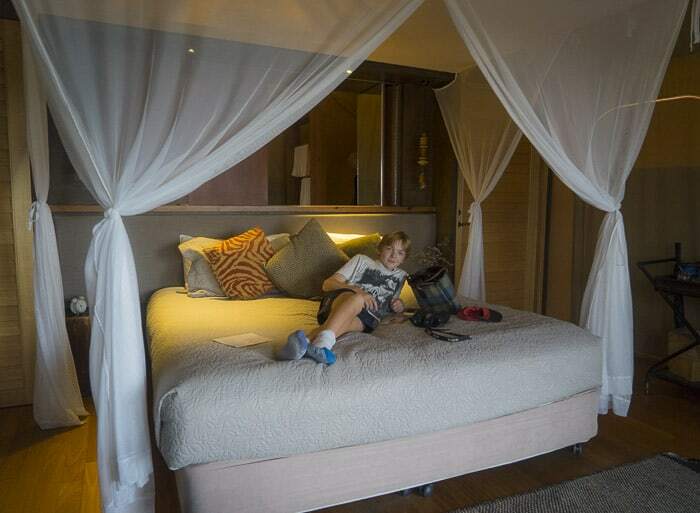 The lodges are pretty luxurious, with beds draped in mosquito nets and massive exotic bathrooms. We had an Animal View Lodge, set right in front of a massive savannah which was teeming with African animals. Our Lodge had a king bed plus a sofa bed for the kids. 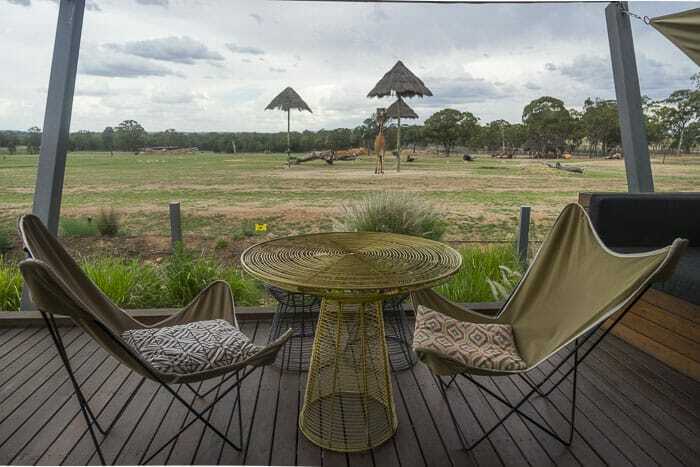 The Bushland View Lodges are set back with no direct view over the animals. These can sleep six people in a queen bed, two singles and a sofa bed. Yes it is and there are several giraffes right there too and lots of zebras. Sitting on the deck of our Lodge watching the animals was a massive source of excitement, it was especially beautiful at sunrise and sunset. Just gorgeous. We felt so remote, and in a wild wild place. Essential to know about and a marvellous place to cool off with the kids. We visited Western Plains Zoo in boiling hot weather and a late afternoon dip in the pool was a highlight. The communal tables and banquet style dining was a fun feature of our stay. We loved that our guide was with us during the meals, telling us stories about the zoo and the animals and helping make sure all the guests chat and mingle. We enjoyed canapes and wine tasting before dinner and then the huge portions of main meal. The vegetarian options were terrific by the way, no whinging from my husband as he tucked into a spicy chickpea and veggie curry. The desserts blew us away though, we hadn’t expected the food to be so 5 star. 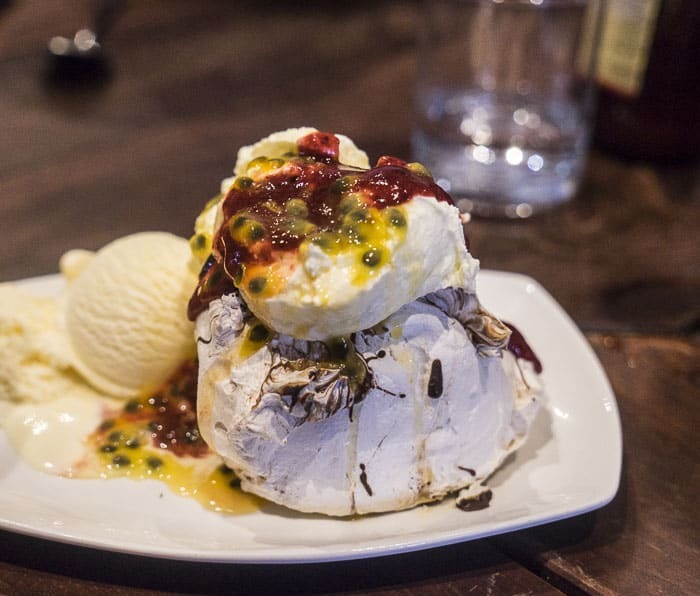 A delicious concoction of meringue, chocolate, raspberries, cream and ice cream had us drooling. Then gobbling. Prices are always per person per night twin share. The costs range a lot depending on time of year and the exact package selected. 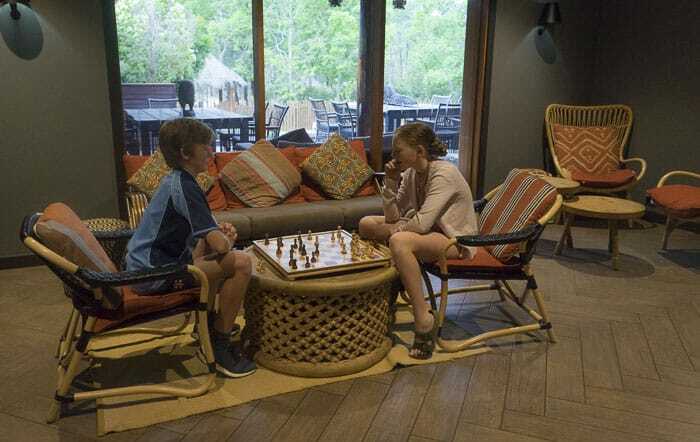 There do not tend to be special Zoofari Lodge deals or discounts, sadly. Read more on the Zoofari Lodge web page here. I do recommend calling to chat through your family’s own needs. There’s nothing like a good chat to staff to work out the best time and way to book in. Arrive early in the day than so that you have time to enjoy the lodge and the views. There isn’t any time to lounge around in the morning so it’s best to get there early on the day you arrive so that relax. Take plenty of snacks for the kids so they can have something to eat on the early morning tour. 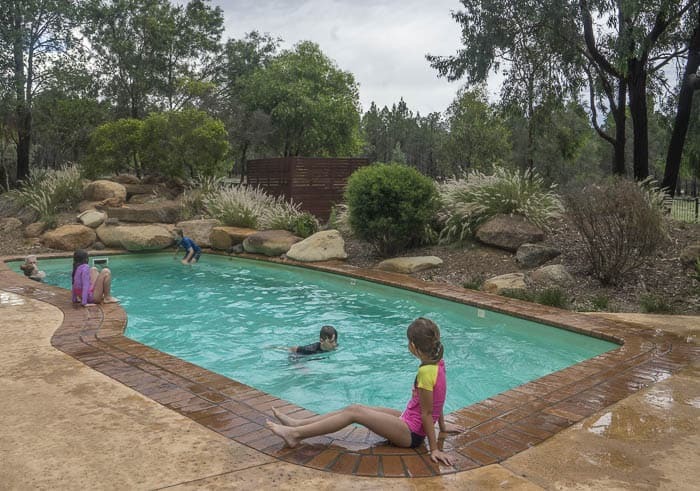 Zoofari Lodge Dubbo really is the top pick for Western Plains Zoo accommodation. It’s also the most expensive of course, but the inclusions are comprehensive and the opportunity to stay at an African safari lodge are unique in Australia. 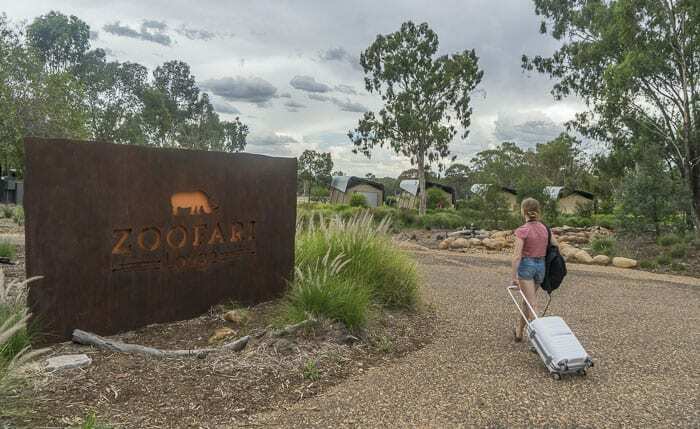 So if you are thinking of a stay at Western Plains Zoo, especially if it is for a special occasion, do check out Zoofari Lodge accommodation options for your family. To read more about things to do in Dubbo and other places to stay there, plus the road trip from Sydney taking in Orange, check out this post. We stayed as guests of Taronga Western Plains Zoo and would like to say a huge thank you to them for their generous hospitality. 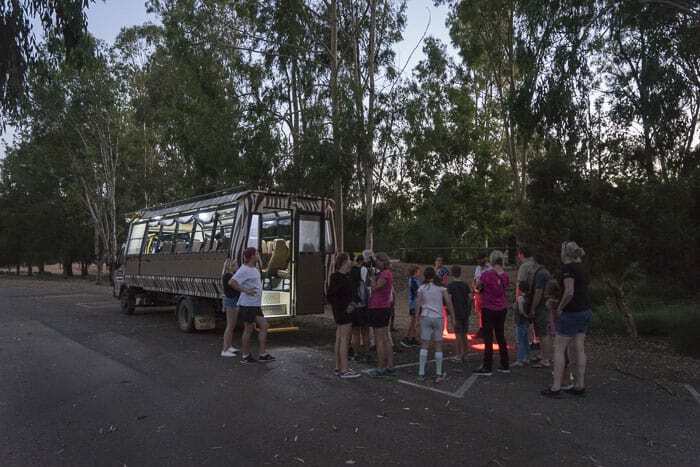 We have previously stayed at the camping option within the Zoo at our own expense, check out the post on Billabong camp at Western Plains Zoo here.